Is Euro zone A Sinking Ship? | Business Article | MBA Skool-Study.Learn.Share. The Euro zone which comprises of 17 nations of the European Union has been plagued under severe crisis. The member countries Portugal, Italy, Ireland, Greece and Spain (sometimes these countries together are referred as PIIGS) have been in the midst of sovereign crisis. The Euro zone which was formed so as to control the inflation rates and to provide economic assistance to its member nations, now seems to be falling apart. There have been reports that Germany and France, two biggest economies in the Euro zone are in talks to exit the Euro zone after the bond rates of Italy went above the key 7% level. Italy is the third largest economy of the Euro zone. After Greece, Germany and France will find Italy too big to rescue. Let’s delve into the causes and a possible way out of these so called the contagion i.e. the unease about growing high debt and slow growth. The major reason for the Euro zone plunging into crisis is that nations like Greece and Italy have surpassed their spending and debt levels mandated by the Maastricht treaty. Let’s look into the problems of these troubled countries i.e. Greece, Italy, Poland, Ireland and Spain. After a grand entry into the Euro zone on 1st Jan 2001, Greece announced that this “historic” achievement will put it at the heart of Europe and will guarantee stability and stability since it had brought its finances according to the Euro zone requirements. However, on 15th Nov 2004, it turned out that Greece had fudged its entry and its debt was never below 3% as required by the European Union (EU). According to the reports, the government deficit was 3.4% of its GDP. The adjoining graph shows the rising govt. debt to GDP ratio for Greece since 1999. One of the reasons has been unhindered borrowing by the Greek govt. for financing the public sector jobs, pension funds and other social benefits. Italy, one of the central members of the Euro zone, is struggling with its anxious investors driving the bond rates well above the 7% mark. At such a high rate, it is feared that Italy can’t pay what it owes on govt. debt. The below graph (Eurostat) shows Italy’s debt to GDP ratio. As seen from the graph, the debt to GDP ratio in 2011 stood at 116, which is unreasonably high. 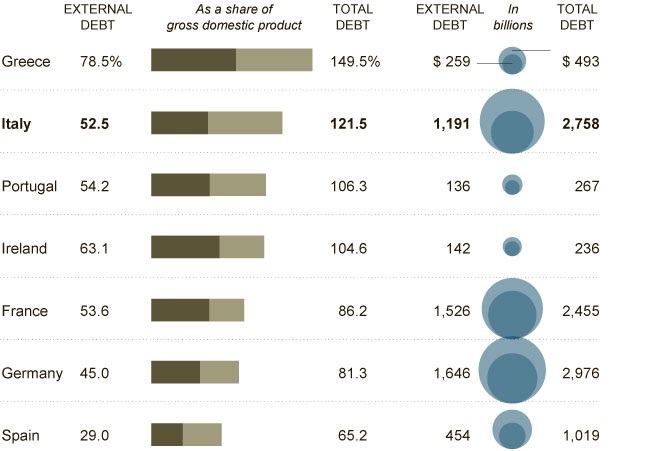 Italy and Greece are two major defaulters in the Euro zone. But the situation is no better in other countries of Europe which have very high debt to GDP ratio as shown in following table (Source: Eurostat). The total debt as a percent of GDP of Greece, Italy, Portugal and Ireland are dangerously above 100%. This clearly spells trouble for these nations. The monetary policy for the region is controlled by the European Central Bank (ECB). Headquartered at Frankfurt, Germany, the bank’s main aim is to control the price rise or inflation. It has set 2% inflation rate as an acceptable level, beyond which it would lead to instability. The bank has been working in close co-ordination with the International Monetary Fund (IMF) to tackle the crisis of sovereign debt. It along with the European Union (EU) constituted the European Financial Stability Facility (EFSF) aimed at providing financial assistance to the Eurozone states. The ECB has granted funds to the Irish and Portugal governments under the EFSF. The Irish government was granted € 85 billion and € 78 billion respectively. The ECB has proactively taking steps to avert a forced default of Greece. As a part of this effort, it along with the IMF agreed for a €110 billion bailout package in return of austerity measures from Greece in May2010. The austerity measures include addressing higher pay packages for the government employees, shutting of inefficient public units and preventing tax evasion. It also required Greece to set up an independent body to look over privatization of ineffective units. George Panpendreou , who took over as the Prime Minister in November 2009 realized the extent of problem only when he took over. His popularity started plummeting since the sovereign crisis had become quite acute when he became the PM. The crisis caused turmoil both within Greece and the Eurozone, raising fears about the existence of the common currency, Euro. Throughout 2010 and 2011, investors continued to demand higher interest rates for Greek borrowing. There were violent protests across the country against the austerity measures proposed by the government, as a part of its commitment to the ECB and IMF. In late October of 2011, Greece received a measure of its potential bailout plan. This package aimed at bringing the debt to 120% of its Gross Domestic Product (GDP). However, this was greeted with a lot of reluctance as it demanded a lot of austerity measures. Greeks felt that their policies were been dictated by Germany and France. In his last ditch effort for survival, Papendreou declared a referendum to be held on the announced package. This sent shivers across the globe, causing a wave of fall in the markets. Bowing to the pressure from Germany and France, he finally reversed his decision for the proposed referendum. After hectic parleys, a united government was formed, with Papendreou resigning and former Vice President of ECB, Lucas Papademos took over. 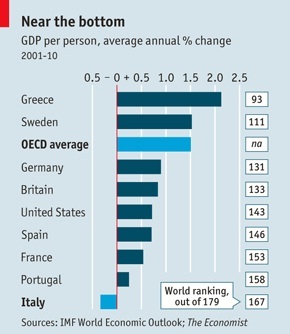 The Economist calls Italy “an oversized Greece”. Italy is considered too big to fall and it will be difficult for the Eurozone members to bail it out of the crisis. The bond rates of Italy have surpassed the key 7%, a level considered critical by the ECB. As seen from the graph above, there has been a fall in the GDP per person and it ranks lowly 179 out of a total of 196 countries. It has GDP growth just above Zimbabwe and Haiti. The PM Silvio Berlusconi was accused of involvement of several charges, at a time when country was reeling under severe economic crisis. After losing majority in the Parliament and amid growing European debt problems, he finally resigned on 12th Nov. The President appointed former EU commissioner Mario Monti as the new Prime Minister of the country. The other economies of so called the “PIIGS” nations also are on the brink of similar sovereign crisis. Let’s get an overview of these underperforming economies. In Ireland, the crisis is not because of overspending but due to the state providing economic assistance to six nationalized banks that financed the housing property bubble in 2008. The government had provided guarantees to the nationalized banks under the National Asset Management Agency constituted by the government. Portugal is a victim of government overspending and inflated investments in public-private projects across the country. The economy was affected by risky credits, public debts and mismanaged European structural and cohesion funds. The government which was formed in 2005 failed to gauge the crisis and later it was clueless when the country was on the verge of bankruptcy. The Eurozone’s fourth largest economy has gone from growing fastest as compared to its neighbors to stagnation in just three years of time since 2008. In 2007, Spain had public accounts surplus of 2% of its GDP. This surplus was converted into deficit in the following year. This is accredited to the decade long property and credit bubble bursts. Thus, as seen, the Eurozone which was formed to help the member nations in economy expansion now sees itself on a wrong footing. There have been talks about few nations breaking away from the body. However, they need to understand the fact that the world economy hinges a lot on the developments in the Eurozone. Any impulsive reaction would lead to cascading effects and shrink the world into another recession. The bailout of the troubled states is possible. With the change of guard in Italy and Greece, it is expected that the new premiers being lead economists, will take rational decisions. So, it is imminent that these nations comply with the norms and ensure that the funds are used in apt way. This article has been authored by Abhishek Agrawal from Welingkar Institute of management.